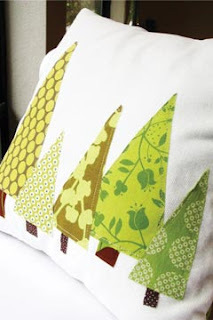 While researching for Saturday's post, I stumbled upon an adorable tree pillow on ShelterPop. The Woodland Forest in Moss Green and Olive pillow is from Etsy designer allisajacobs and her other designs are just as unique! Since fabric has been purchased to make my own pillows, I used this design as my inspiration. I was making this pillow from scratch so I purchased a 12"x16" pillow form and the white cotton fabric to make a cover. I pulled out my sewing guide - Martha Stewart's Encyclopedia of Sewing and Fabric Crafts: Basic Techniques for Sewing, Applique, Embroidery, Quilting, Dyeing, and Printing, plus 150 Inspired Projects from A to Z - and followed the directions to make an envelope-backed pillow cover so that I can change the cover after different holidays. It was fairly easy! Then I picked three print fabrics that look good together and could be used for 'trees'. 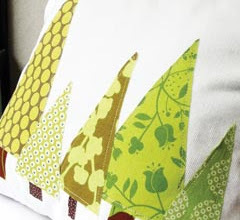 Walking on the crazy edge of crafting, I just cut out three triangles without using a template and hoped for the best. I didn't worry too much about perfectly straight lines. Because the pillow cover was already sewn together, I chose to glue the trees and stumps directly on the pillow using Dritz 6.51 Ounce Quilting Spray On Heat Set Adhesive and an iron. Then I used the tip of the scissors and frayed the edges of the trees. this looks great! and what a great way to use up some remnants one might have. stopping over from polly want a crafter. I am SEW impressed with your increased skills on the Singer!! My favorite detail of this adorable pillow is the frayed edges on the trees. Lovely pillows. you're a real crafter; not into wasting anything, lol. Such a fun idea! You are so talented. Thank you for dropping by my blog too. Thanks for linking up with Theme Party Thursday. 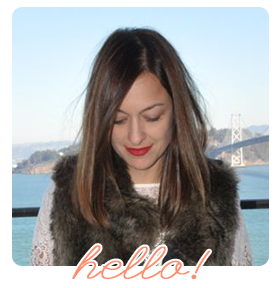 What a beautiful, inspiring blog! 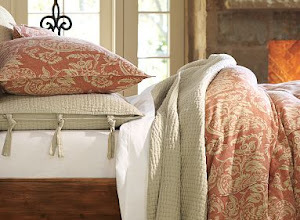 Love the fabrics you picked. What a great little pillow- I'm still making my Christmas/winter pillow covers and I think I'll have to make one of these. Fabulous! This is great! I'm a new follower! I featured you on my blog today - Today's Top 20. Would love if you could stop by! Clever! Easy!! So beautiful, I am inspired. Thanks for sharing. I'm glad you enjoy my pillow design! I really appreciate you crediting my work and linking to my shop. Feel free to tweet or FB about the post and thanks for letting me use your photo and link! 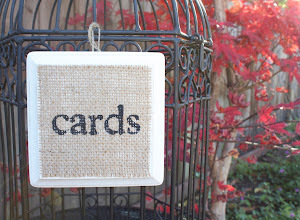 I absolutely love this project AND your choice of fabrics! Thanks for the inspiration!